Spend ½ of the day exploring Early Settlement in Upper Canada through 3 — 30 minute programs – Trade & Barter, Pioneer Play and Digging Detectives, (details are below). Each program includes hands-on activities and a game or craft. The other ½ of the day has 3 more fun ‘Hands-on’ programs, discovering some local history. ‘Aye Aye Captain’, ‘Phones and Postcards’ and ‘More Pioneer Play’ (details below) are each a pprox. 30 minutes long, with a game or craft along with hands-on activities. Trade & Barter — Relationships between the Europeans and First Nations were important in the War of 1812. Play a trading game with European and First Nations trade goods, and use your own copy of an old map to explore these relationships which gave Muskoka its connection to this war with the United States. Phones and Postcards — what was it like before the days of cell phones and Facebook? Find out how the early cottagers and tourists kept in touch.Use old working phones, and make your own postcard to mail. Picnic tables & Washrooms are on the Island. We can accommodate a maximum of 60 children due to space and staffing restrictions. Please use the Museum’s School Booking Form to book your class. This program focuses on the Sound component of this unit. By using our old working phones and switchboards, students will be introduced to a hands-on opportunity to understand the forms of sound, the terminology of sound, as well as the unique characteristics of sound through our feature exhibit. While students use the phones to investigate the basic properties of sound, they will learn and use many problem-solving skills while using this sound device. Students will leave the museum with a thorough understanding of the sound objectives and components of the Grade 4: Light and Sound Ontario Curriculum unit, as well as a strong vocabulary in relevant key terms. This program includes pre-visit activities, museum visit activities, as well as post-visit assignments. Email the museum for a complete lesson plan, including assignments. With a focus to engage students in a hands-on, interactive lesson on understanding the First Nations Peoples of Canada and European exploration. With a focus on local Aboriginal tribes and early exploration, our 1st Gallery is completely devoted to artifacts and history that relates to the First Nations history of Muskoka, as well as the changes that took place when the Europeans arrived. With a focus on the pre-exploration history of First Nations Peoples in Muskoka, the motivations of European Explorers, as well as the contact between the two groups, this program offers a great interactive learning experience for students to better understand the early history of Canada. Carefully fulfilling many, if not all, of the Ontario Curriculum requirements for the Grade 6: First Nations Peoples and European Explorers, this program is a great hands-on opportunity for students to gain a further understanding of Canadian history through local history and artifacts. Pre-visit and post-visit assignments are included, as well as hands-on museum activities. 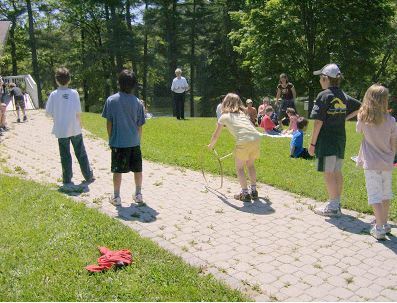 Focusing on many of the objectives and requirements of this course, the Muskoka Lakes Museum program encourages students to analyze artifacts and gain a further understanding of past events. Students will also learn about government-Aboriginal relations, identify current Aboriginal groups and leaders, explain the significance of Aboriginal symbols, be introduced to relevant terminology, gain an understanding of primary and secondary sources, as well as analyze and evaluate information. This program includes a pre-visit and post-visit assignment, as well as structured, educational museum activities. We also welcome additional units, and will do our best to accommodate your requirements should you be interested.